In Santiago city and its metropolitan area live over 6 million people, more than a third of the entire poplulation of Chile. 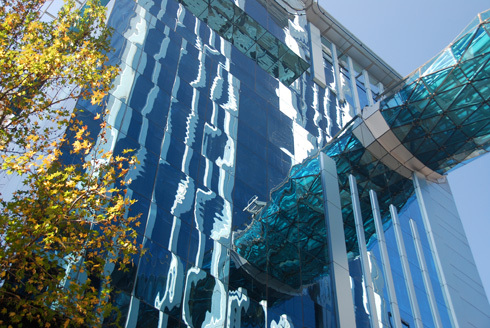 Santiago is the political, financial and cultural center of the country. 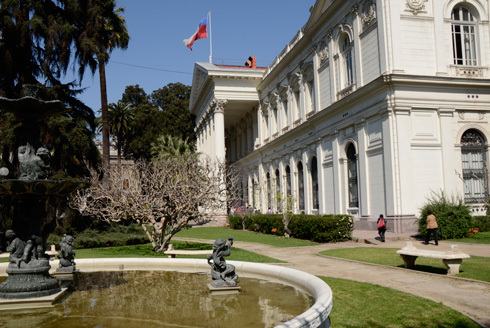 There are a number of theaters, museums, galleries and a lot of other possibilties to discover Santiago and to get to know the Chilean way of living and their generous hospitality. 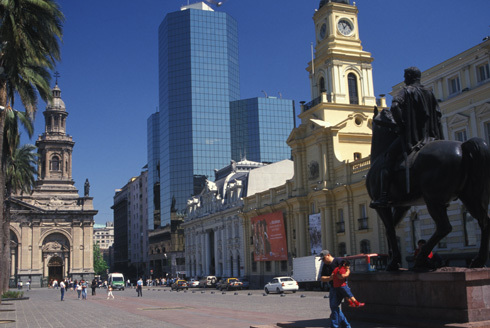 For a sightseeing tour you may start at the Plaza de Armas, restructured in 1999, right in the historical center (metro station is also called Plaza de Armas). This square place with its music pavilion, green areas and park benches was named for the weapons that were kept here at the time of Pedro de Valdivia to protect the settlers. Later the Plaza was the meeting point for public events, for troop parades, religious processions and even executions. Nowadays you can see parades on Sunday afternoons imitating colonial times - without executions, of course. To the West is the cathedral, a building from the 18th century with an opulent interior decoration, mostly furnished by Bavarian Jesuits. It is the fifth church that was built on this site. North of the Plaza are three other historic buildings: The Post Office, earlier palace of the governor, the Museo Histórico Nacional located in the former royal audience hall and the city hall on a site, where a prison used to be. 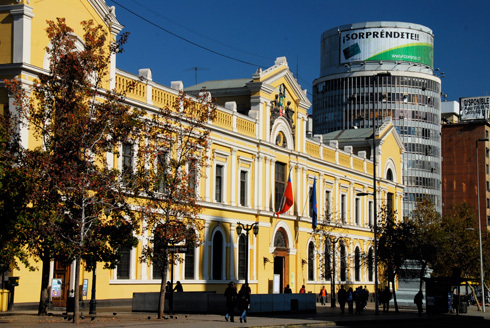 The city center, an example for colonial city planning, is made of continuous squares (cuadras). 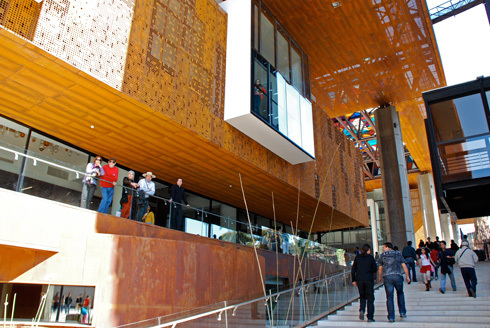 Walk one cuadra to the West and you will get to the Museo de Arte Precolombino holding a collection of historical and cultural artifacts of Latin-American native people. 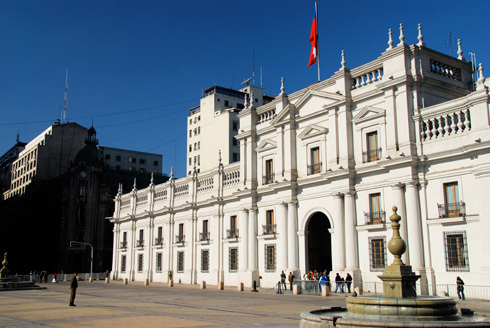 Between the streets Morandé and Teatinos is the "Coin Palace" La Moneda, originally the National Mint, which was built in 1788-1805 and from 1846 residence of the President. At the military coup of 1973 the building was bombed and President Allende committed suicide. Nowadays, you may walk right through the interior courtyards of La Moneda, and with a little luck even run into President Lagos himself. 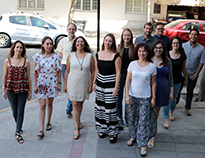 At the south side of the palace is the arts center Palacio La Monda located, which hosts alternating exhibitions - Check out the article Barrio Cívico for more information-. Going from the Alameda (short and practical name for the main street of Santiago, officially: Avenida Libertador General Bernardo O'Higgins) towards the East you will get to the district Paris-Londres on your right hand-side. These houses were designed in the 20`s displaying various patterns of European architecture. 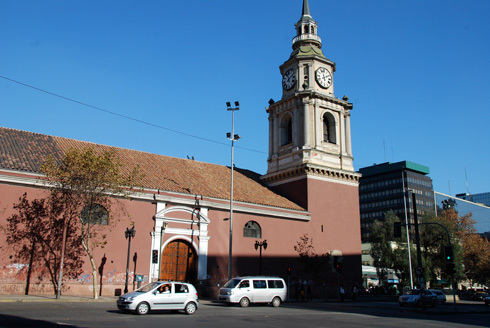 You will also see the Iglesia San Francisco, built in 1618, the oldest church in Santiago and one of the few remaining buildings from the old colonial times. Pedro de Valdivia is supposed to have brought the altar picture of the Virgen de Socorro himself to Chile. Another landmark is theTeatro Municipal (at the corner San Antonio/Agustinas), a baroque ensemble with classic French colonnades. From the top of the city hill San Cristobal you have an impressive view onto the city and the Cordillera. 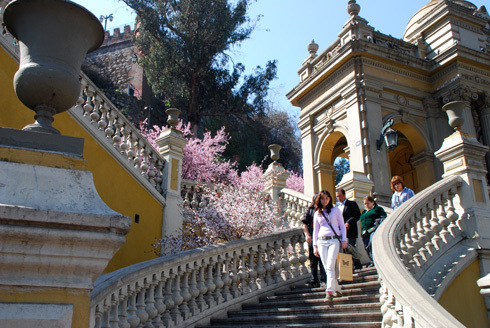 Santiago offers much more than the city center. Other Barrios like the famous Bohemian district Bellavista or the student district Barrio Brazil surrounding the Plaza of the same name, the pictorial street Concha y Toro (Metro República) or the taverns around Plaza Ñuñoa in Ñuñoa give you the impression, as if you would not be in a metropolitan of 6 million people. Away from the city center you are surrounded by friendly, colorful, one or at the most two-storey houses, nice bars and restaurants, galleries and cultural centers or secret places, where you easily escape the hassle of the city. In the district Lastarria you will find a cozy inner courtyard of the Plaza Mulato Gil de Castro (Lastarria 305) with a nice café, restaurants and some peculiar bars, such as "Berris". If you are looking for Chilean rather than European flair, you should visit the Mercado Central (corner San Pablo/Puente), a beautiful market building from 1872. Enjoy the vivid market while eating fresh seafood, preferably in the morning. If you continue walking up north you get to the district Bellas Artes and the Parque Forestal where you find the Museo de Bellas Artes, a neoclassical palace of Fine Arts. 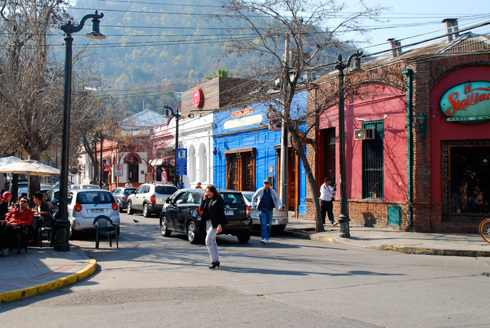 Wealthier people live in the upper part of the city, the Barrio Alto. 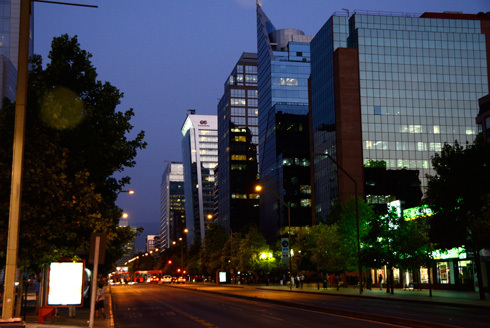 The districts Las Condes, Vitacura and Lo Barnechea as well as parts of Providencia resemble modern, American style districts (often only to be reached by car) with many shopping malls and exquisite cuisine. 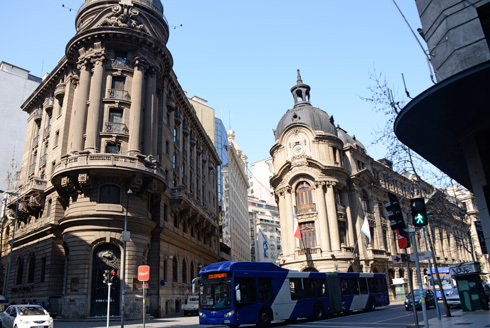 In this part of Santiago you also find the "high-end" financial district Sanhattan and the in 2012 inaugarated building Costanera Center which hosts a gigantic mall and various offices.